Premier made a major change in our breeding/lambing system for our 800 ewes this year. We switched from pasture lambing 80% of the ewes (with a Dec breeding season) to shed lambing 50/week (in a heated barn without drop pens) 75% from Feb through April. 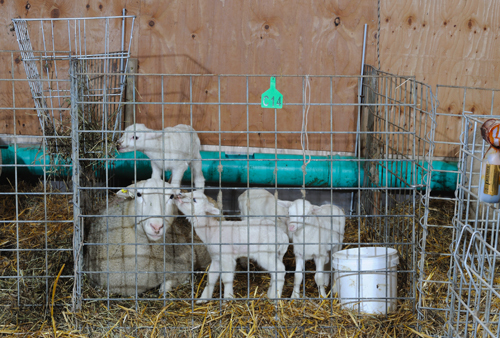 This article explains why we made this change and our initial lambing results. Dystocia problems were surprisingly few. Conception rate (based on lambs inside ewes at scanning) was less than anticipated—180-190% for adult ewes (mix of hair, wool and wool/hair crossbreds). Weaning lambs were in the 160-170% range—again less than expected for these genetics (Dorper/Romanov/Katahdin/Border Leicester/Ile de France). Serious losses occurred when an ice/rain event lasting 4 days occurred in late April. Coyotes were a challenge to keep “at bay.” We have plenty of guard dogs but we rarely allowed them in the lambing pastures—wishing to avoid any extra disturbance. Managing fences, sheep and dogs was not simple or quick. As our stocking rate/acre increased (our ewe numbers expanded), the higher density of lambing ewes increased mismothering issues. This intensified because our pastures have trees and ponds, around which the flocks would congregate on hot days to avoid the sun, gnats and flies—which, in turn, meant more mismothered lambs. Mid-summer internal parasites combined with our southeast Iowa summer heat/humidity to make finishing lambs on grass ever more difficult as stocking rates increased. The lambs were ready for slaughter September through December—the same time as most lambs born in the USA are available. One of the 3 sets of quads we've had so far this year. Both the ewe and her lambs are doing well. We built a new warehouse in 2012. This released a 5000 sq ft building originally built as a sheep barn, which we had later converted to be a windowless warehouse (with insulated walls and ceiling, concrete floor, LP heaters). This building was now “free” to use. We changed it back to a sheep barn. Premier has excess labor in the winter, but not in the spring. So we made a dramatic change. Beginning September 1, every 2 weeks we exposed 100 ewes to rams (some hair, some wool terminal sires). We used marking harnesses on our rams to identify the week each ewe was served. This continued for 4 months. We installed 66 lambing jugs in our insulated barn. Each jug will be used sequentially in February, March and April by 10 ewes. An extraction fan runs continuously (unless it’s a windy day) to draw in fresh air. Here is the key point: We put the ewes into the jugs just prior to lambing. There is no drop pen at all and there are no mismothering issues. Also no frustrating games of trying to induce just-lambed ewes with part-Romanov genetics to move into a jug. Because we keep the temperature at 40 degrees (plus or minus), hypothermia of newborn lambs doesn’t occur. To prevent shepherd burnout, we check the lambs throughout the day, at 9 p.m. and 7 a.m., but not during the night. The ewes lamb and the lambs nurse on their own. We don’t help them. We put iodine on the lambs’ navels and that’s it. For bedding we put in 2 inches of reject lime as a bottom layer and then add straw and extra lime (to kill microbes) as needed. Drop rate (including stillborn, late abortions, deformed, etc.) has been 210%. Clearly our ewe genetics are more prolific in September/October than December. Number dead? 25, of which only 8 had any real chance of living (others were stillborn, deformed, tiny, aborted or breech during the night). It’s surprising to us how rarely we’ve had to turn on the heaters. So far, the bedding and ventilation system has meant no disease outbreaks (e.g., E. coli or pneumonia). But bedding buildup (5 inches after 4 weeks) means we will need to remove and replace the bedding at least once during lambing. A surprising number of lambs (7%) have been born with teeth sharp enough to cause their own mothers to prevent them from nursing. We file down their teeth with a flat diamond file. Unless the teat tissue has been damaged, the ewes immediately allow them to nurse. We will cull these ewes. The core workload involves feeding, watering, bedding and moving pregnant ewes in and ewes with lambs out. Will we do this again? Definitely. Why? More lambs born and more lambs saved (perhaps 30 lambs/100 ewes). More lambs that will be off to slaughter before July’s heat and humidity. Fewer coyote and internal parasite concerns. Fewer lambs to sell in the lower-priced months of September/October/November. Delivery systems for bedding and water (all jugs will have some form of unheated, cheap automatic waterers). Location of sorting system for ewes prior to lambing. Setup of post-lambing pens to allow easier animal movement. Fewer large terminal sires (bigger lambs at birth result in more lambing difficulties). We will lamb for 6 weeks and then stop for a week to allow time for a mass lambing-pen clean-out event. We fully understand that this system is not suited for everyone. We happened to already have the labor and building. Telling you about it is not a recommendation. It’s early days. We have 450 ewes yet to lamb and put through the system. We may run into serious disease issues. It’s regrettable, to us, that pasture lambing here in Iowa means December breeding—a month in which conception rates are much lower than September/October. One problem we foresee is having a few hundred dry ewes (post weaning) in the spring when our grass is most nutritious. It’s going to be hard to keep them from getting too fat without doing harm to a pasture. We’re considering buying cornstalk bales and grinding them for feed. We will pasture-lamb all ewes (250) that lamb after April 22.